Judea and Samaria Division Commanders tour sites where recent terrorist attacks launched and discuss dealing with surprise incidents. Judea and Samaria Division Commanders took part this week in a learning day following the recent terror attacks in the Binyamin area. 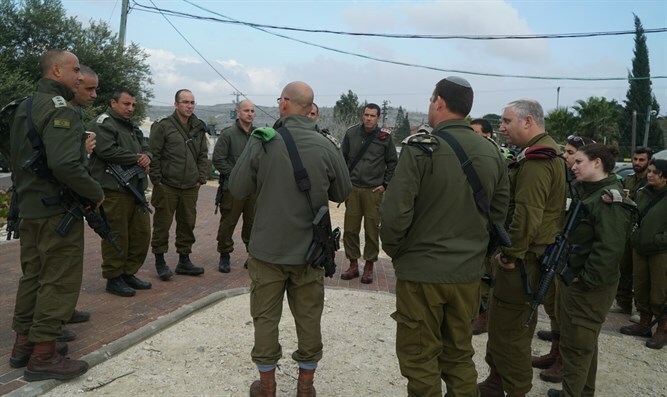 The meeting was held in the Binyamin Regional Brigade, during the course of which commanders toured sites where attacks took place last week. Commanders held a joint conference to discuss force field readiness. Additionally the commanders held a discussion on coping with surprise incidents and the ability to respond with precision to these incidents to learn lessons for the future. The IDF said "the Judea and Samaria Division will continue to act to protect the residents of the area." Prime Minister Binyamin Netanyahu met yesterday during his visit to the Judea and Samaria Division with soldiers from the haredi Netzach Yehuda Nachal battalion, two of whose comrades were murdered last week at the Givat Assaf junction attack. "One of your friends is fighting for his life and we're all praying for him, while achievements have also been met. I'm sure it's only a matter of time before we reach the third," Netanyahu encouraged the fighters. "I spent the day with your commanders, the Chief of Staff, and Division Commander; we're very appreciative of your activity and are absolutely confident of our ability to fulfill the main mission. "The main task is first of all to strike at terror, preserve the security of the State, the security of the settlers, and, as far as possible, maintain quiet in this arena, even vis-a-vis the Palestinian residents," he said. Netanyahu said, "I understand that there are many developments, inventions, and technology, and in the end it comes to you at the checkpoint, on the roads, or in the settlements. The operational activity has to be done in the best possible manner, with the most professional soldiering and ultimately with the heart and the soul. Every one of you knows that, and that's why you're here. "Our entire pyramid is built on you, the soldiers and the commanders, as much as we add means and capabilities - and we add a lot - in the end it's built on you. I'd like to express my great appreciation and salute you, and all the people of Israel join me," Netanyahu told the soldiers.